Bible Cartoons: Rich man and Lazarus cartoon series completed! Rich man and Lazarus cartoon series completed! I have just completed the last scene in my series “The Rich man & Lazarus”. The final scene shows Lazarus in heaven, with Abraham & 2 angels, net to the cross of Jesus. NOTE: there are 2 versions of these scenes, Colour & Blue. I have been wanting to draw this Famous Bible Story for quite a few years, but just never made the time to do it… now I have – hurray! 1) It is a challenging series to draw, from a design & colour perspective. All that fire & contrasting coloured light! 2) It is challenging from a Gospel & Christianity perspective. The issue of Heaven & Hell is at the very heart of Christianity. Where we go to spend eternity at the end of our earthly lives is VERY important. From a Christian perspective we only have 2 choices: We can accept that Jesus is who he says he is: God, or we can reject his claim & reject him. The former will lead us to repentance for our wrong doing (for all have sinned); forgiveness (from God to us) & inclusion in the kingdom of God based solely on faith. 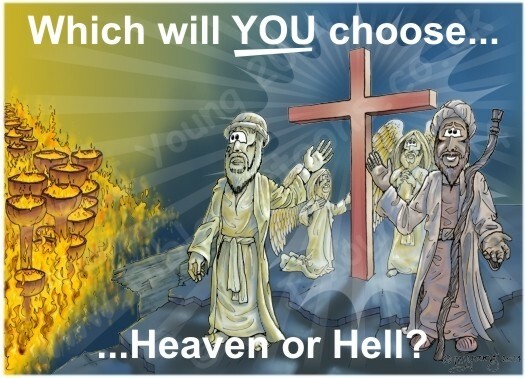 The latter will lead us away from the free gift of eternal life with God, & that naturally leads to the place set apart for the unrepentant sinner: Hell. The choice sounds very stark, but the Gospel of Jesus is called “The Good News” because it is just that. We all have the same choice, & the same opportunity whilst the breath of life is within us, to either accept or reject the claims of Jesus; to either accept his offer of salvation, or to reject it. Accepting Jesus leads to Heaven & rejecting Jesus leads to Hell, it really is as simple as that.